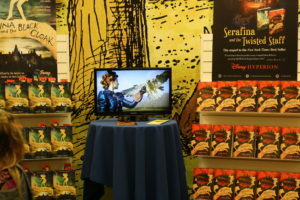 On Tuesday, the next installment of the Serafina series hit stores, and it made a grand entrance. Amazon quickly filled up with five-star reviews, easily making it a best-seller in several categories: literature and fiction, historical fiction, mysteries, animal books, and spine-tingling tales. Who is Serafina? She is a wild and wonderful character that sprang from the vivid imagination of author Robert Beatty. 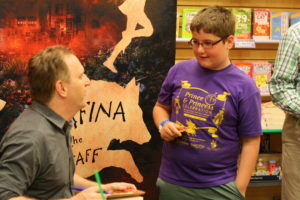 His first book, Serafina and the Black Cloak, released last year to rave reviews. Thanks to the well-deserved praise, Beatty was asked to write two more Serafina books, plunging readers back into the world of the eloquent Biltmore Estate hidden among the mountains, of cascading waterfalls and deep forests, of ancient legends, and most importantly, of an extraordinary girl who rises from the humble job of Chief Rat Catcher to the brave and courageous heroine, defeating the mysterious man in the black cloak. Beatty’s work is not only wonderfully inventive, it is exceptionally well-written. Beatty indeed has a gift. As a lover of good literature, and as an educator, I found much to adore in these books. They are imaginative, clever, and very addictive! The book has many twists and turns, and for those who love a pinch of the macabre, you will not be disappointed. I was impressed with the quality of these books. Middle-grade literature can be hit or miss, but Serafina? She is definitely a hit. If you are an educator, you can receive a FREE class set of Serafina and the Black Cloak by inquiring on Beatty’s website. The site offers educational resources for class discussion and assessment. I recently conducted an interview with Beatty and attended a stop on the Twisted Staff release tour. What follows is a delightful exchange. CH: For those who are new to Seraphina, can you give us a brief synopsis of what the books are about? RB: Serafina and the Black Cloak is about a little twelve-year-old girl named Serafina who lives secretly in the basement of Biltmore Estate. She the daughter of the maintenance man and she’s kind of a strange and unusual little girl. She has strange eyes that can see in the darkness and she can sneak unseen and unheard. She prowls around the estate at night. The Vanderbilts who live in the floors above don’t even know that she lives down there. One night she sees something very spooky happen. It’s a terrible crime and she has to figure out the mystery of what’s happening. She gets together with a boy named Braeden Vanderbilt, the nephew of the Vanderbilts, and they work together to try to solve this mystery. The new book, Serafina and the Twisted Staff is the continuation of their story together. You have a lot of neat elements there that will appeal to a wide audience. Sometimes we say it’s filled with history, mystery, and magic – all combined. Robert, you have had an interesting journey. You pioneered cloud technology, started a robotics company, and worked with Narrative Magazine for a while. Can you tell us more about that? Yes, when I was about twelve years old, I developed two passions right at the same time. One was writing, and I started my writing efforts at that point. I used to write novel after novel. They weren’t very good but I practiced and worked and tried to improve them each time I wrote one. I’ve been writing passionately my whole life. But at the same time, I had to eat and be able to live so I got a day job as well. I became an engineer and a software programmer and had a corporate career. I became the founder and CEO of an internet software company and then a robotics company, so I became an entrepreneur, but the whole time that I was an entrepreneur, I kept telling everyone around me, “This is great and everything but I really want to be an author. I want to write stories that other people will fall in love with.” I just kept working and working at that and eventually succeeded. Very cool and very encouraging for many people who want to pursue that as well. Right. One of the main things is that we all have different backgrounds. My background wasn’t necessarily great in terms of education or learning how to write. I started at a very low level of writing capability but just by practicing and learning and teaching myself, I developed my capability over time. Now when I look at many of the kids today, my daughters for example, they are getting a much better education. Their writing skill is way better than what I was doing when I was young. My main point is there is hope for everyone, no matter what level of writer they are now. If it’s your passion, if you love to do it, just keep doing it. What inspired you to write Serafina? Discuss how you went about bringing Serafina’s story to the world. For a number of years, I was writing novels for adults. I was very focused on that and didn’t think that I should be doing anything else. When I was younger, what I read and what I loved writing was fantasy novels. Once I became an adult, I abandoned that and started writing other novels that weren’t fantasy, that were more realistic fiction for the adult market. I thought that was what I was supposed to be doing. But then one day, as I was struggling away at my desk, my daughter came in and asked me if she could read what I was writing and I said, “No” because she would just find it boring. It wasn’t for kids. A few months later she came back and asked me again and I said, “No, I’m still working on the same novel.” Then she came back a few months later and put a manuscript on my desk. It was a manuscript that she had found in a box down in the basement. She said, “What’s this?” I said, “That’s a novel that I wrote when I was about fourteen years old, but I don’t write books like that anymore.” She said, “Well, you should because I just read it and loved it!” That really caught me because here I was struggling away to write this novel, and here was my daughter saying she had just read something I’d written a long time ago and loved it. It really caught my attention. What I really loved when I started was fantasy novels so what if I wrote a fantasy novel for my daughter? The next day, I put away the novel I was working on and I said, “Well I’ll just try it for one day and see how it goes. I’ll probably not be any good at it. I’ll probably not enjoy it but I’ll give it a try.” As soon as I started trying, it’s like a fell into a whole new world. I totally loved it. I started writing like a madman after that. While I had always enjoyed writing, now I totally loved it because I was writing what I loved, which was fantasy mixed with history and magic and spookiness, things like that. I was writing for my daughters and that just gave me a whole new passion. I really wanted them to enjoy the story, so I thought the best way to make sure they enjoy it is to have them help me write it. I got them involved in my writing process. I’d read them a chapter and then say, “What should happen in this chapter? What’s good with it? What’s wrong with it? What can we do to improve it?”They would give me all of their feedback and I’d rewrite it and then I’d say, “Okay, what should happen in the next chapter?” We developed the story of Serafina together. We’d go to Biltmore Estate and explore rooms and the corridors and we’d talk about it at dinner. We definitely developed and created and refined the story together as a family. I know Tolkien did that with parts of The Hobbit because he had written that for his children. Right. When I said that I was reading when I was younger and loving what I was reading, it was Tolkien that I was reading. That’s really where the genesis of my inspiration came from originally. Now, this isn’t a medieval novel set it old world Europe or England or anything like a typical fantasy. One of my goals in writing Serafina and the Black Cloak was to create a story that had the feel and the spirit of a Tolkien-like novel, of a classic fantasy but have it set here in the Blue Ridge Mountains. I just thought that would be a neat combination. In some ways, you’d be like, “How does that work?” They’re in totally different worlds, totally different times, totally different places, but I thought I would give it a try and see how it worked. I was pleased recently that Serafina has been nominated for a Mythopoetic award. 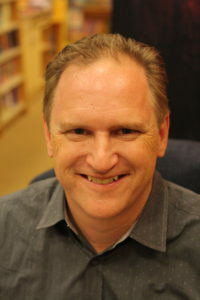 I was really pleased that, even though the story is set in the Blue Ridge Mountains in the 1800s, the people of the Society [Mythopoetic Society] were able to see its spiritual connection, the feel of it, and to some degree, the morality of it – the good versus evil and heroes and things like that – come from the background of Tolkien and C.S. Lewis and the Inklings. What were the most formative authors for you as a writer? In that area, it was Tolkien and C.S. Lewis. I also love Neil Gaiman. But I also love the classic [authors] like Hemingway and Jane Austen. Quite a variety! Some of our readers are also writers. Describe your creative process. I’ve talked a little bit about it, so much as my daughters and my wife are involved in my creative process, but in terms of the actual writing that I do, the main thing is that I need to be alone. I need to be in a room where it’s quiet and it’s just me for hours at a time. It sounds lonely, but I like doing it and that’s how I’m able to write. I have real trouble writing without that. I’ve always wanted to be one of those cool writers that could go the coffee shop and write on their laptop. I just find that impossible! (laughs) My main thing is that I need to be alone and a lot of the serious writers that I’ve talked to share that. I tend to write first thing in the morning and I keep writing as long as I can. Then I break to eat and share a meal with my family, then I write some more. I write both in the morning and at night. I don’t have any difficulty with that. When I’m in a serious writing mode, I tend to write all day, every day. I get kind of obsessed with it. I really get deep into that world in an obsessive way and when the book’s done, it’s done. The main enemy for writers is distraction and procrastination. Life is just very distracting. The world is amazing and it’s hard to pull away from it and get into the world of your imagination. The procrastination element is that, despite how much fun it is to write, it’s still very easy to come up with excuses for not writing. It’s the main enemy for a writer. [Writers] just have all sorts of reasons for why they don’t write today. You’ve got to get past it. The other advice I have is don’t wait for inspiration. That’s not going to work. Forget inspiration or whether you feel like it, just get in front of the computer or your paper and pencil, or whatever you use, sit yourself down and say, “Okay do it.” Even if it seems like it’s junk at first, you’ve just got to do it and get in the pattern of doing it and keep after it. I know this is hard, but which character was your favorite? For fans, which character seems to be their favorite? In the first book, everybody loved Serafina, as do I. I love how weird she is, for lack of a better word. Many books have been written about a girl feels like she’s strange and unusual but really isn’t. She just has to come to grips with herself and realize that she’s okay and she’s normal. Lots of books have been written like that. I wanted to write a book where the girl was, in fact, physically and mentally quite strange and unusual, yet it didn’t bother her. It didn’t hold her back and she just did her thing. Her uniqueness and her differences were her strengths. She used them to her advantage. I tried to write the story from her point-of-view as much as possible and have her looking out into the world. From her point-of-view, she’s not unusual or strange. She’s just Serafina. She’s just who she is. I think readers like that about her, that she’s different but doesn’t mope about it. She gets on with her life. That’s a great message for kids! I also like Braeden. I put a lot of myself into Braeden, her young friend. It’s no coincidence that he is a friend who has a special connection with animals. That’s a fantasy of mine. There’s a lot of me in Braeden. In the second book, there’s a number of new characters that are introduced. There’s a maid named Esse who befriends Serafina. She’s a young mountain girl from Madison County who speaks in southern dialect. She becomes one of Serafina’s good friends. So Serafina is still your favorite? Oh, yes. For sure. I just think she’s awesome! To me, she’s taken on a life of her own. I can just imagine her as a person, separate from her being my creation. To me, she just seems like a person. We congratulate you on the many awards Serafina and the Black Cloak received last year. Can you tell us about some of the accolades for the book and how that feedback shaped the sequel Serafina and the Twisted Staff? As you said, the first book was very well-received and won many awards. On Goodreads, it was voted the #1 best Middle-Grade book. It had very strong reviews from Kirkus and School Library Journal and Publishers Weekly. It also just recently won the 2016 Pat Conroy Southern Book Prize. It’s been deemed as representing the best in southern literature, which I was very proud of. It has also been a New York Times bestseller for 22 weeks. It hit the New York Times bestseller list on the first week and has remained there on and off for 22 weeks. It’s doing very well. It’s being published in many languages and in many countries all over the world, which is very cool. 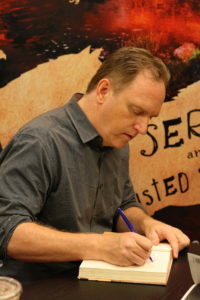 It was selected for Battle of the Books in North Carolina and other states around the nation. It was recommended by the girl power website called “A Mighty Girl” which I thought was very cool, very appropriate. Yes, it’s been getting lots of attention. To me, what’s good about that is that people are enjoying the story and that encouraged Disney Hyperion, my publisher, to come back to me and say, “write some more.” In the end, that’s what I most wanted. I wanted to write a book that would be enjoyed enough that the publisher would come back and want some more. So they came back and asked for two more books. When I sat down to write the second book, Serafina and the Twisted Staff, honestly I was terrified. 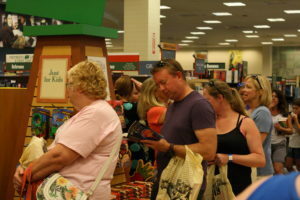 Although I written many novels up to that point, while I was writing Twisted Staff, I was going to book signings and people were telling me how much they loved Black Cloak. I was terrified that I wouldn’t be able to write another book that they liked as much as the first one. My daughter came along and said, “You know Dad, it’s a well-known fact that the sequels to books are almost always worse than the [original] book. They’re almost always bad, so don’t write a bad book.” No pressure or anything! (laughs) I was really scared, but I had to plow through that and write it the best I could. I have been very, very pleased that everyone who has read the first book and then has read the second book has enjoyed the second book even more. They say that it’s written better and that they love it. It’s even received better reviews that than the first book. So far so good! What can readers look forward to in this next installment? 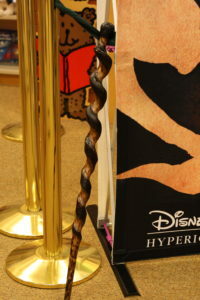 In Serafina and the Twisted Staff, [the story] starts up right after the end of the last book. It’s a direct continuation of the same story with Serafina and Braeden. New things are happening at Biltmore Estate. They encounter new dangers, new threats, and a new villain. There’s a number of new characters. I’m mentioned Essie, a maid that lives up on the fourth floor of Biltmore Estate. Serafina encounters her and they don’t get along right away but they eventually become friends. She meets the famous historical figure named Frederick Law Olmsted. He is the landscape architect of Biltmore Estate as well as many other places around the country including Central Park in New York. He’s one of the main characters in the story. The other element is that we get outside Biltmore Estate a little bit and go out into the mountains and into the forest. We see the waterfalls and the rivers. It’s very tied into the Blue Ridge Mountains and also into the wildlife, the animals of the Blue Ridge Mountains – wolves, catamounts, or mountain lions, as well as peregrine falcons and owls and all sorts of other animals play a big role. 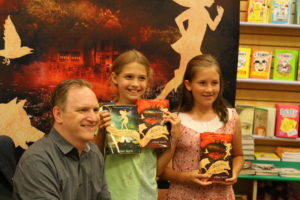 To purchase Serafina and the Black Cloak, click here. 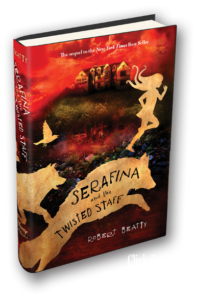 To purchase Serafina and the Twisted Staff, click here. Crystal is a writer, poet, reader, and public school educator from Virginia. She is happily married with three beautiful Terriers (adopted from local shelters). Her dissertation explored the leadership of C.S Lewis with postdoctoral work focusing on the leadership roles of artists. An unapologetic book nerd, Crystal loves to read and research works involving faith, literature, art, and leadership. She also possesses a deep, unrelenting interest in all things European, especially Doctor Who. You can read her weekly thoughts on her webpage/blog www.crystalhurd.com, friend her on Facebook, (Crystal Sullivan Hurd) and follow her on Twitter: @DoctorHurd and @hurdofficial.